With the spectacular Ode to the Bowl event hosted by The Spare Room still fresh in most of our memories from the previous night, it was time for the serious business of the first official day of the 10th Annual Tales of the Cocktail. 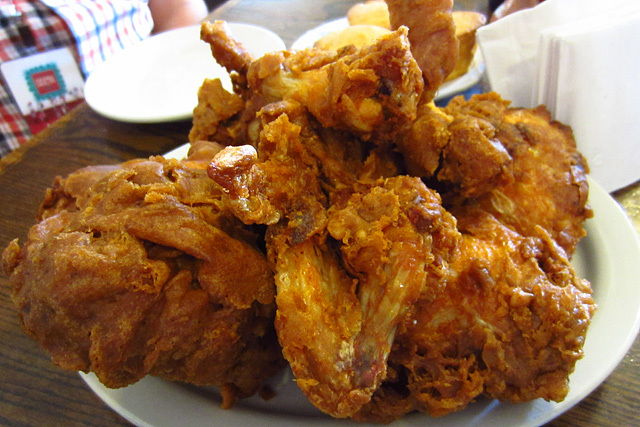 I don’t know about other attendees, but for me this year’s Tales didn’t begin with a seminar or a tasting room, it began with “America’s Best Fried Chicken.” That’s what it says on the menu at Willie Mae’s Scotch House, and it’s a claim that’s backed up 100%. Willie Mae Seaton first opened her small corner restaurant as a bar in the 1940s, before she started serving her famous fried chicken. Seaton has passed the secret recipe to her great-granddaughter Kerry Seaton, who now helms the stoves at Willie Mae’s. After hopping in a cab with Dave Stolte (Home Bar Basics) and Matt Robold (RumDood), we arrived at the beloved Treme neighborhood eatery just before it opened at 11am. The menu is as basic and straightforward as the decor; the three-piece dark meat plate with sides ($10) has to be one of the world’s great food bargains. The chicken is fried to order, and even with sky-high expectations that first bite is indeed a revelation. The skin is crispy, but light and airy; Kerry Seaton has been quoted as saying the only seasoning is salt and pepper. Beneath the jagged peaks of skin, the meat is juicy, tender and perfectly cooked. Willie Mae’s Scotch House was destroyed by Hurricane Katrina in 2005, just months after Seaton received an “America’s Classic” award from the James Beard Foundation. The remarkable story of how the Southern Foodways Alliance helped Seaton reopen her restaurant in 2007 is told in Above the Line: Saving Willie Mae’s Scotch House, an hour-long documentary that’s well worth a viewing. After spending a few years in Paris, Crane returned stateside and opened The Luau on Rodeo Drive in Beverly Hills in 1953. Crane, who had adopted the persona of “High Talking Chief Stefooma,” was friends with Don the Beachcomber and reportedly didn’t get along with Trader Vic. For The Luau, Crane completely renovated the former Sugie’s Tropics space and designed a lush interior that surpassed both tiki icons. 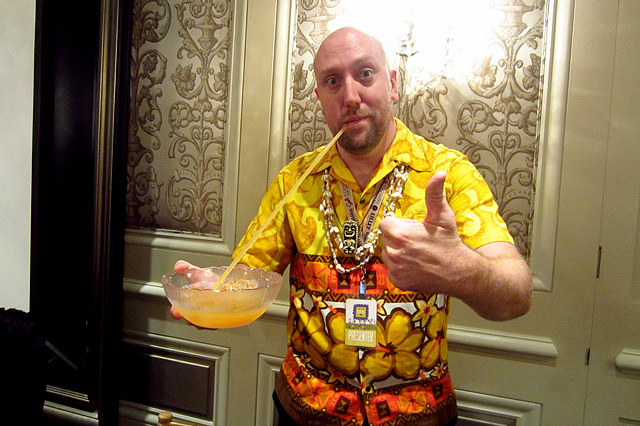 The Luau boasted waterfalls, macaws, fish tanks, and even giant “man-eating clams.” Tiki drinks were “inspired” by Don and Vic, like the Luau Grog (aka Navy Grog) and Tiki Bowl (Scorpion Bowl) that were served at the seminar. Instead of a cliché “Polynesian” menu of faux Chinese food with pineapples, Crane upgraded the cuisine with steaks and chops at a higher price point. The Luau was an instant hit and became a hotspot for the rich and famous. Building on The Luau’s success, Crane partnered with Sheraton Hotels to open the Kon Tiki chain of Polynesian-themed restaurants. To manage the enterprise, Crane created Stephen Crane Associates. Every aspect of the elaborate Kon Tiki interiors, down to the mugs and napkins, was designed in-house. Beginning with Montreal in 1959, the chain would grow to seven cities, including Waikiki. Cate noted that in Chicago, although there were 22 bartenders working per shift, there was only one bartender at front-of-house, because Crane wanted to provide “an escape” and didn’t want guests to see the “chaos.” Crane also operated Ports o’ Call restaurants in Toronto and Dallas, the latter featuring a clipper ship called the White Cloud as its entry and four exotic “ports.” At its peak in the 1960s, Stephen Crane Associates was bringing in $10 million a year. Crane sold The Luau to an Iranian consortium in 1978, and sadly the restaurant was razed to the ground. Crane’s contract with Sheraton was dependent on The Luau staying open, so after its demolition Sheraton severed its ties with Crane and the Kon Tikis eventually closed. Crane died in 1985 and is buried in his hometown. Cate described Crane as tiki’s “forgotten hero,” ranking him as “the third man in the great historic tiki trifecta” alongside Don the Beachcomber and Trader Vic. 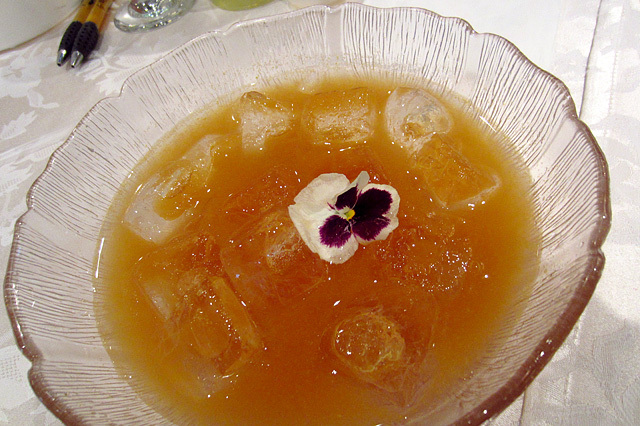 Although The Luau and Kon Tiki restaurants are no more, Crane’s visionary concepts and innovative techniques continue to influence new generations of bartenders, restaurateurs and tiki aficionados. Note: pieces from Kon Tiki #2 in Portland were part of the decor at Thatch Tiki Bar, which was purchased by Blair Reynolds this spring and is scheduled to reopen in the fall as Hale Pele. After the seminar, we luckily ran into Andie Ferman of St. George Spirits. I say “luckily” because the personalized dog tags she was handing out (complete with “If found return to…”) would prove to be useful later in the week. There was a quick detour to do a Jägermeister bone luge on the roof of the Hotel Monteleone, a few minutes for a disco nap, then it was off to dinner at Cochon New Orleans and liver stretches at Bellocq before hitting the William Grant & Sons Big Birthday Party. For more photos, please visit the Thirsty in LA Facebook page. 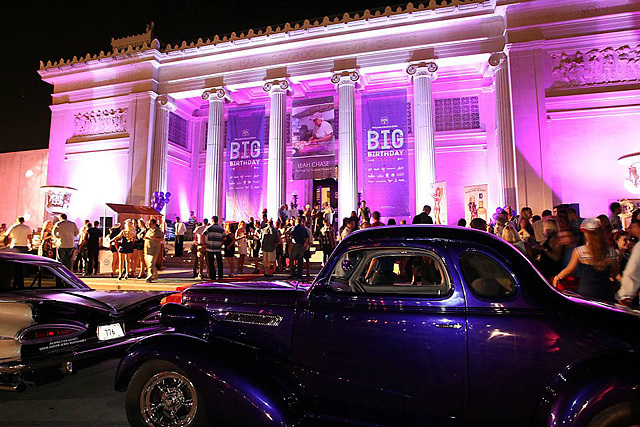 To celebrate Tales of the Cocktail’s 10th anniversary, William Grant & Sons took over the New Orleans Museum of Art (NOMA) to host the Big Birthday Party, its annual portfolio extravaganza. 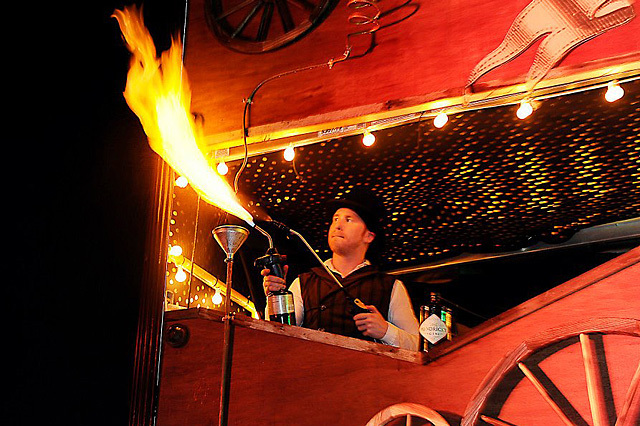 Over 1,200 guests explored the sprawling installation, which included everything from a giant birthday card to the Slap and Tickle Village, which featured bartenders shaking made-to-order cocktails while jumping on a trampoline. Inside the relatively quiet Great Hall, guests could sample expressions of Glenfiddich and The Balvenie. Just off the main entrance, Rich Andreoli and Mia Sarazen (Areal) were mixing it up for Sailor Jerry, while 1886 Bar’s own Garrett McKechnie and Lacey Murillo were nearby holding it down for Stolichnaya. 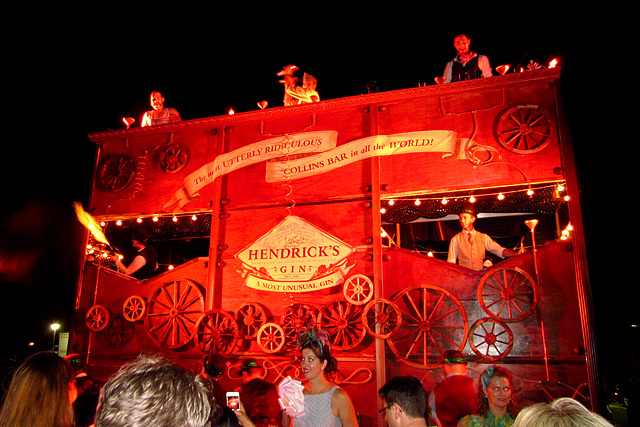 Those who braved the muddy lawn were rewarded with “The Most Utterly Ridiculous Collins Bar in All the World,” a three-story Hendrick’s Gin bar that Rube Goldberg would be proud to call his own invention. 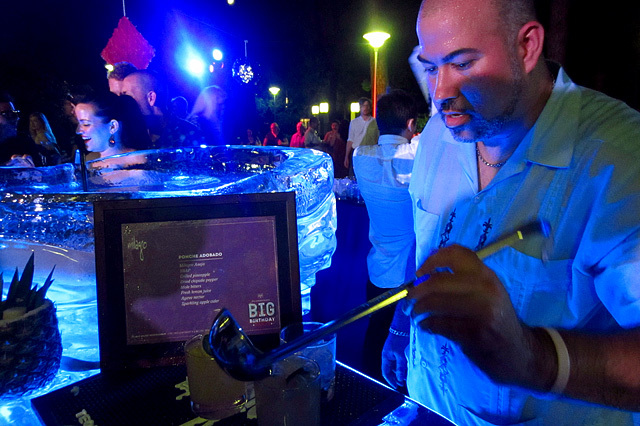 At the Milagro Ice Bar, Gaston Martinez serves the Ponche Adobado: Milagro Añejo, SNAP, grilled pineapple, dried chipotle pepper, mole bitters, fresh lemon juice, agave nectar, sparkling apple cider. Fireworks and burlesque dancers closed down the Big Birthday festivities at NOMA, and for many Day One of Tales was winding down. For others, Day Two was just getting started. 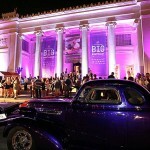 For more photos of the Big Birthday Party, please visit the Thirsty in LA Facebook page.